Many thanks to Brad and Shelly (of Shepparton Sewing Centre - the dealer I bought my Bernina longarm from). I contacted Shelly right away and she was just an angel, arranging for Brad to come here this past week and fix up "Bernie" for me. As it turned out, the problem was caused by my not pulling through the bottom thread before stitching. Now, I've done that many times when just playing around and experimenting, never had a problem. Brad assured me it's rare, but sometimes the bottom thread can get jammed up in the bobbin mechanism and cause a timing issue. And that's what happened to me. Well - you can bet I'll never make THAT mistake again. It turned out for the best, because Bernie was due for periodic maintenance anyway, so Brad went ahead and did that while he was here (it only took 10 minutes to clear the thread jam). So the thread jam is cleared, I've learned an important (if somewhat expensive) lesson, and Bernie got herself a lube job. Quilt 108: "Flight of Fancy" - DONE! 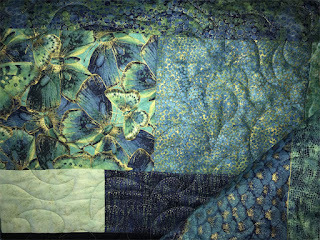 I love the rich teals and turquoises - and the fabric has little flecks of metallic gold as well. 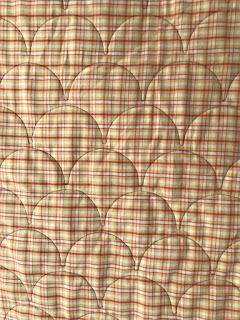 I used a soft dove grey thread for the quilting, and am very pleased at how well the stitches fade into the prints. 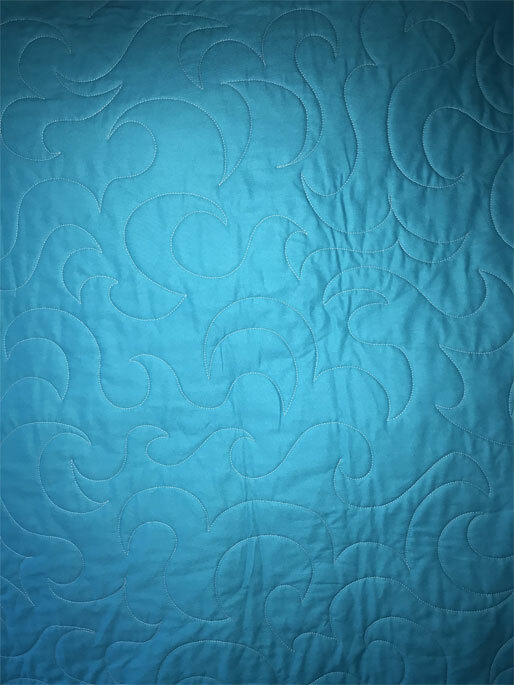 I'm getting quite comfortable with the "nested C's" freemotion quilting pattern. It's easy to do and is the fastest stitch pattern I've used so far. I'm very excited to say that I decided to take the "plunge" and get the Q-Matic computerization accessories for "Bernie" (my longarm). The dealer delivered it yesterday, hooked it up, and spent about 3 hours with me teaching me the basics. The user interface is more than a little daunting, and not terribly intuitive. But I was doing pretty well. I'd planned to stitch a few practice bits and then blog about it, showing examples of what it can do... but... something went terribly wrong. 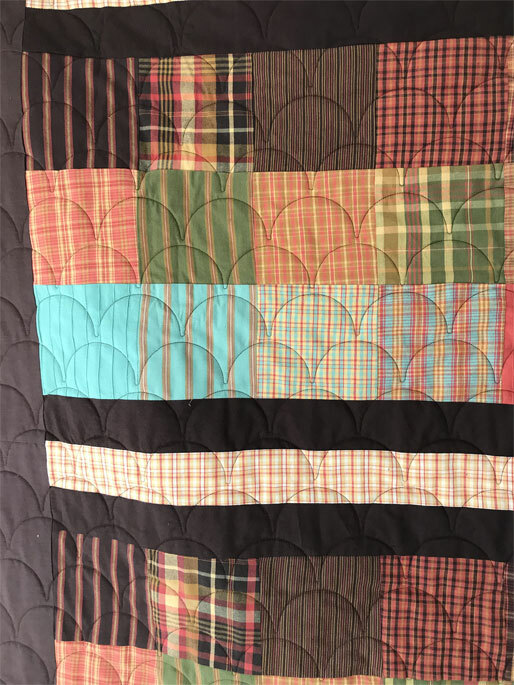 I was doing end-to-end patterns and had just advanced the practice quilt to get the next row. 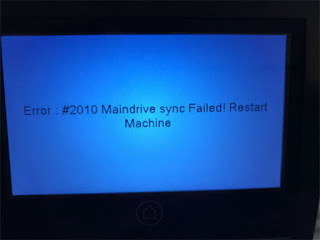 Just as I started up, there was a horrible grinding sound and the machine just froze! 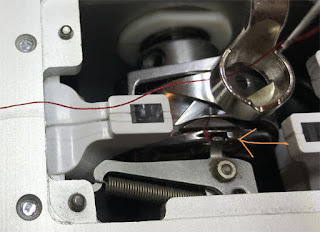 I pulled off the switchplate to find that the bobbin mechanism is frozen. There's a small metal tab, which is blocking it from rotating (photo below with an orange arrow drawn in to point to the metal tab). I rang the dealer, and she's sending a repairman next week. Disappointing, but it'll be OK. I'll just get busy and whip up some more quilt tops while I'm waiting. 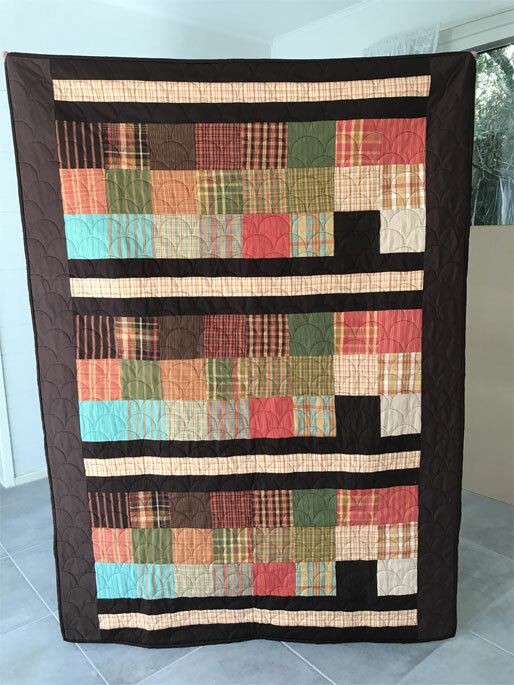 Quilt 107: Orange Mocha (Sonnet Collection) - DONE! A couple of weeks ago I posted about a charm square project I started, but ran into trouble when I found that some of the squares in the back had been incorrectly cut (click here to see that post). 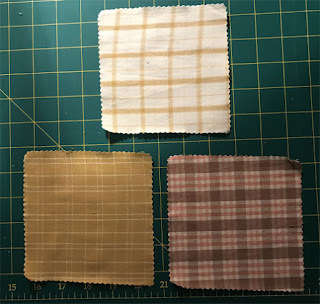 All the squares in the pack were fabrics with plaids or stripes - and several were cut at an angle. Yes, you will still see the crooked squares if you look closely, but they don't really scream. 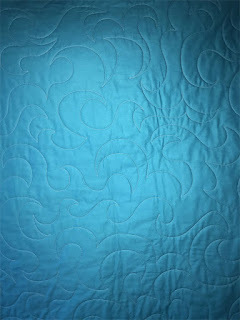 And, after quilting (I used my new "Shells" groovy boards), it looks lovely, even with the imperfections. 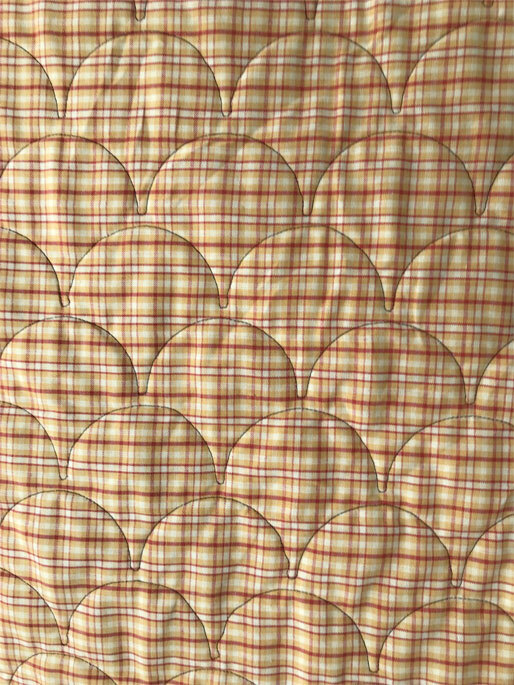 I love the "Shells" groovy board pattern. It took a couple of practice rows before I got a good feel for how the board should be approached. My stylus wiggles a little in the grooves, and if I'm not careful, I get wiggles in the stitching. But I worked out how to do it and the results are great. 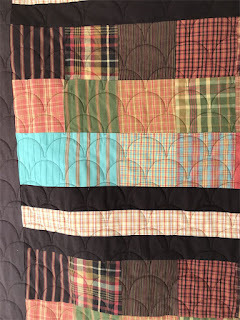 And, because the "Shells" grooves aren't as dense/close together, it took very little time to complete the quilt. For this one, just under 3 hours (and that was with thread that kept breaking on me). Pretty good! The fabric shop was having a sale and they had some charm square packs marked down REALLY low. I snapped some up in a hurry. Should'a looked the pack over carefully, however. 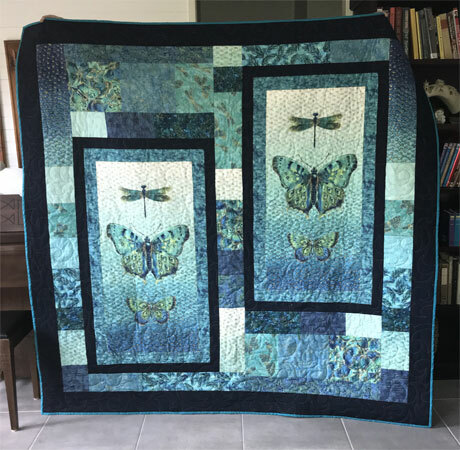 Last week's post was about a quilt top I made with one of those sets. Some of the squares were cut wrong in that pack. I went ahead and used them anyway and yeah, the quilt looks fine, really. Ouch. 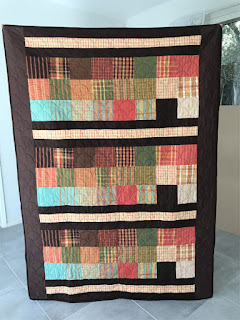 I got away with crooked squares in the Orange Mocha quilt - but this one? No. Too many squares out of alignment and off way too far. The daughter of a friend has been playing with fabric bits - SHE might enjoy playing with these squares - so I'll give them to her. And from here out, you can bet I'll be looking more closely at charm square packs before I buy them!